My year as President of the CAP is winding down, but the pace of the CAP’s activities is most definitely not following suit! You will soon be seeing many of the fruits of our communications labours of recent months, some of which are described elsewhere in this Bulletin. The Congress is taking shape, and we certainly hope and expect those in attendance will be amply satisfied with the experience. This will include the Herzberg Lecture given by Nobel Laureate Art McDonald, a familiar name to many of us even before October 2015. On an overcast Saturday afternoon last month, I participated in the Montreal March for Science held on Earth Day (under weather conditions rather different from Vice-President Stephen Pistorius’ march, described below). 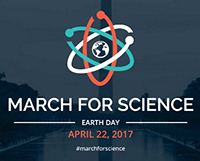 An estimated 1000 participants took part in the March, which culminated in a set of inspiring speeches which highlighted not only the importance of science for technology (the smart phone being one example mentioned), health and other applications, but also just the importance of science for the sake of understanding the world around us. The message was all the more urgent given the current political climate in the US, with (to mention just one example) an Environmental Protection Agency headed by a man who previously was a very outspoken, downright hostile critic of the Agency he now heads. I saw several CAP members in the crowd, including (see photo) former CAP President Louis Marchildon of the Université du Québec, Trois-Rivières and Charles Gale of McGill University, who is this year’s recipient of the CAP-TRIUMF Vogt Medal for Contributions in Subatomic Physics. I hope to see many of you at Queen’s University at the end of the month! The above is just a sampling of our recent activities and developments. I invite you to read the entire Bulletin to learn more. If you wish to get involved in the CAP in any way, your help would be appreciated; please contact me or the CAP office at cap@uottawa.ca. Professionally Speaking… As discussed in our last column, work on the Continuing Professional Development (CPD) program for P.Phys. holders has been progressing. The draft CPD was brought to the Spring CAP board meeting for endorsement, and it was accepted. A copy of the current version of the proposed CPD can be downloaded here. Development of a simple CPD reporting tool (that will be part of the CAP website) is in progress – we hope to have something to demo at the annual CAP Congress in Kingston. CAP recently did a small “benchmarking” study of the P.Phys. process and requirements with those of the Institute of Physics (UK) Chartered Physicist designation. This comparison identified several areas for further investigation, and again, we hope to have something to discuss at Congress. And on the subject of congress, I hope to see many of you there. We are holding our Professional Physicist gathering on Tuesday at 7pm. Michael K. O’Neill, M.Sc., P.Phys., P.Eng. The Federal Budget 2017, released about two months ago, themed and dreamed on a single word: innovation. The CAP Science Policy committee summarized relevant physics-related impact in en French here or in English here. 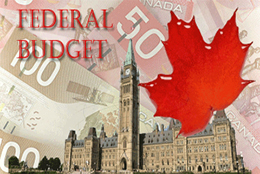 In short, this year’s budget boiled down to the government saying: we want to be a country that has “innovation”; let’s spend (mostly) last year;s dollars on it; and let’s redesign and streamline government agencies to support this. This buzzword, when used from governments, typically points to generating ideas and rapidly putting them into practice for an improved product or service. Here, however, the working definition here may be much broader. To physicists, perhaps the biggest impact was the noted lack of funds for fundamental research outside of targeted “challenge” areas to any of the Tri-Council’s operating budgets. This might have something to do with (at press time) the yet to be released Fundamental Science Review’s results on fundamental science funding and operation. However, it is to be noted that there now exists a $2 million per year budget for the new Chief Science Officer position and secretariat, and the creation of 25 new Canadian Research Chairs to attract/retain research talent. It will be interesting to see how that Fundamental Science Review will address how these new positions will someday compete for (currently stagnant) future Tri-Council funding with everyone else. An important element for innovation is the development of technical and problem-solving skills in Highly Qualified Personnel. This was addressed for the future and nearly-present working generations from increased science outreach funding to PromoScience and education opportunities for teaching kids to code for school-aged children. In addition, Canada Student Loans saw increased eligibility, especially for part-time students. It is currently unclear how science will continue to fare and be received by this government, but we shall see. The CAP has been working to establish the foundations necessary to execute our new Communications Strategic Plan. The first step was a visual rebranding which will bring a fresh face to the organization. We are pleased to announce that the rebranding has been successfully completed with the release of our new logo. · Adjust the lettering so that the acronym could be interpreted in both French (ACP) and English (CAP). · Make the logo bolder so that it stands out at a distance and in small print. · Revert to the old logo if the above criterion were not met. The CAP engaged a graphics professional to craft the design, and after a several month process which included many iterations and consultations within the CAP Council and elsewhere, the Board settled on the new logo design shown here. The new logo will be rolled out immediately for the 2017 CAP Congress printed materials, and will soon be incorporated in our electronic communications. The next steps in our Communications Strategic plan include releasing our new website, and developing a new “customer relations management” (CRM) database system to manage CAP communications efforts. Stay tuned for announcements at the upcoming CAP Congress in Kingston and in the coming weeks. 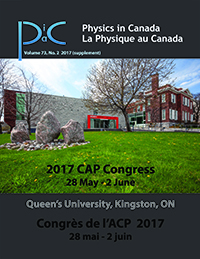 The 2017 CAP Congress is quickly coming up, this coming Saturday May 28 until June 2nd at Queen’s University in Kingston. If you haven’t done so already, follow this link to register for one day sessions today. Please note that full Congress passes have been exhausted, but we would be happy to see you in Kingston next week to enjoy our award winning plenary talks, the annual Herzberg public lecture held by Arthur MacDonald, enjoy the 2015 Nobel Winning exhbit on neutrino oscillations, networking BBQ, and many more activities to not be missed. The full 2017 CAP Congress e-Program has now been made available online for attendees, speakers, student competitors, and everyone to consult everything you may need to know about the upcoming 2017 CAP Congress. Click on this link to consult the e-Program of the 2017 CAP Congress. The printed program is available as well and will be arriving to the delegates and speakers mail shortly. I was invited by the American Physical Society (APS) to join them for their April Council Meeting in Phoenix, Arizona on 22 April 2017. As the meeting coincided with the March for Science, the APS Council headed en masse into downtown Phoenix in 309 K weather to show our support for science, to encourage investment in science and to identify the importance of the scientific method and training in STEM to society. Speakers from many backgrounds, including Laura Greene, the APS president (who is an invited speaker at the CAP Congress in May/June) spoke to an enthusiastic and supportive crowd outside the Phoenix City Hall. Following the speeches, the APS Council members (and myself) replete in APS Caps and “Physicists March for Science” T-shirts, took to the streets with a diverse and inclusive throng, to the chant of “Science not Silence.” While the APS Physics Executive tried to ensure that their message was apolitical, it was clear that many of the speakers and marchers had other opinions, as their (often cleverly worded) posters illustrated. The march in Phoenix was not as large as that in Washington or other major cities around the globe. However it allowed us to spend two hours focussing on the importance of demonstrating the value of science to the general population and politicians of all parties, and for me to get to know many new APS colleagues from around the world. The 2020-2025 Five-Year Plan will be shaped in part through broad community consultation. Hosted at TRIUMF, Science Week is scheduled from July 10-14, 2017 and will play a crucial role in this consultative process. Science Week 2017 will consist of topical workshops from Monday through Thursday, followed by the TRIUMF User Group (TUG) Annual General Meeting on Friday. The workshop series will provide an opportunity to brainstorm plans and ideas for TRIUMF’s scientific activities for the period 2020-2025 and beyond. The local organizing teams will solicit input for the program and reach out to the community in forthcoming communications. Each session will reserve time for discussing both continuing commitments and new directions. Please feel free to contact local organizing teams directly with ideas for their respective workshops. We are issuing a call for proposals for any and all activities that might involve commitments of TRIUMF resources and expertise during the five years covered by the plan. The submission deadline will be in the late summer or early fall, 2017. The submissions will be reviewed by the Policy and Planning Advisory Committee (PPAC). More information will be forthcoming. While it is not mandatory to attend Science Week 2017 in order to submit a PPAC proposal, we aim to include all major current activities in the Science Week 2017 program. We encourage new ideas to be presented in this forum for discussion and initial feedback from the community. The program and all of the details can be accessed on this page: http://www.triumf.ca/FYP2020-25. Moreover, visit our Physics in Canada website at http://www.cap.ca/pic-pac/ for the full, searchable, archive of published issues. Click here to return to the full News Bulletin Vol. 16 No. 2 (2017 May 17), in order to consult all the news of the CAP and the Physics community in Canada.